I am a total Nutella addict- but I have never cooked with it beyond spreading it on crepes (does that count?) These looks so yum! I have never tried nutella cookies - looks like they are patiently waiting to be devoured! Oooh - and I just bought a huge 2-pack of nutella at Costco! Yay! I cannot wait to try these Mary, I will let you know how many I end up eating in one sesh! whaaaaa - MAKING these tonight - i have all the ingrediants too - THANKS LOVE!!!! I know what you mean! Though I think it's safer for me to bake with it than to have the jar in my kitchen...just asking to be opened at any and all times day or night! Oh these look so delicious.....two of my fav ingredients - PB and nutella! This looks like a great one...thank you so much for posting this!! 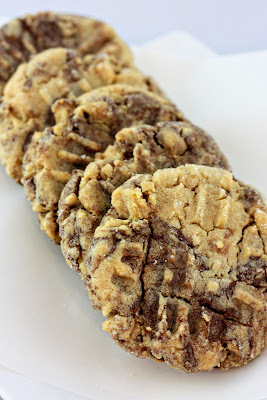 I am picking up some Nutella today (it never stays long at my house) so I can make these cookies tonight!! tempting cookies, feel like giving a big bite. You had me on the nutella. Surely is delicious. What a delicious twist on peanut butter cookies. Happy I found you too. You have a great blog here! Nutella is like a drug. I don't mind being a slave to her at all, tho. :-p She's lovely, isn't she? These cookies look outstanding. I love how rustic they look, and the PB combo with the Nutella sounds intoxicating! :-p Love it! Yummy cookies, I love the combination of peanut butter and nutella. Thanks for the visit, glad you found me so I could fine you, those cookies look fantastic. I'd love some! OMG love these! So glad you stopped by my site so i could find yours! Mary - Thanks so much for dropping by my blog the other day and for your lovely comment! I'm glad to have found your blog as well - it's beautiful. I love your clean layout and bright, crisp photos. I have a thing for Nutella and these cookies look over top good! I'm glad I found you too!! Wow.. this looks so rich and nice. And yes, I love nutella too. Definitely will bookmark this in my to-bake-list ! those look AWESOME! i'll have to give them a go sometime. 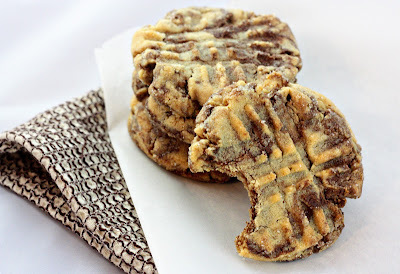 These cookies look majorly delicious, love the swirl! I've been out of nutella for far too long, I need to get some and try these cookies! Yes yes and yes! You had me at nutella. Will have to make these asap. Oh, those are so pretty. I always see Giada baking with Nutella but I am not a huge hazelnut fan, so I didn't think I would like Nutella, but you have just convinced me to give it a try! Oh my... I have honestly never baked (or at least not since I have lived on my own, which has been... 11 years. So uh. Pretty much never! But these make me want to tryyyy! I love nutella (I highly suggest grilled nutella sandwiches in a panini press!) and pb cookies are my fave, so this sounds like a dream! Okay so you are the one who's about to add 20 pounds to my a* I mean hips! These look crazy good. I have to say I'm a little pissed Dominos does not deliver these. ahahaha! Thank you for stopping by my page, I really appreciate you taking the time to comment. You had me at Nutella ;) I think I know what I am making this weekend! Thanks for stopping by, and the kind comment! Wow - those cookies look lethally delicious! I may have to brave baking with Nutella to try them. I don't buy nutella because I would just eat the whole jar with a spoon! These cookies look delish, maybe I will succumb! I am defiantly making these, YUM!! They look so pretty!! I'm bookmarking these and making them this weekend. Yummy! Can I also say that I appreciate your beautiful food photography. So lovely. These look great!! I can't wait to make them. And I Must say, your blog is very eye catching. The photos are amazing! Thanks for leaving a comment on my blog. I'm glad you found me, because now I've found you! I was just checking out all of your cookies posts, and cakes, and treats - lol.... Can you tell I'm a sweet tooth junkie? These cookies are beautiful. Thanks for sharing your recipe! Thanks for visiting my blog today. Your site is great I'm glad I stopped and I'll be back for more great recipes. Nutella rocks my world! I eat it by the spoonful. Thanks for stopping by my blog..it brought me to your BEAUTIFUL site! Looks like we've got two nutella spooning men on our hands! I just had to make a nutella tart as a peace offering for mine! Cookies, look great. I'll have to bookmark this for the next time I get myself in trouble! Nutella in cookies? So genius and obvious yet I'd never thought of it/had it! are you serious?!?!?! these look incredible! on my must try list! Two of my favorite foods, nutella and peanut butter, both in the same cookie?! Yum! I cannot wait to try this recipe! Wow, these look amazing! 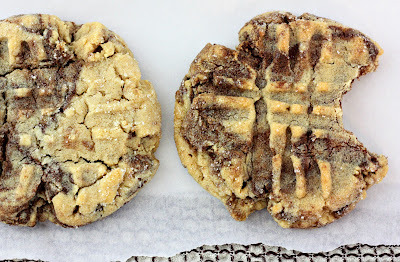 So much more interesting than plain peanut butter cookies! I have a love affair with Nutella. But.... ssshhh... don't tell anyone. I eat it by the spoonfuls when no one is watching. These look amazing! Those cookies look ridiculously good. Seriously. Love the blog, can relate on many levels. (Dysfunctional dieter...so perfect) Great pix too. Just found your blog via cupcakesandcashmere and I cannot wait to make your recipes! What a wonderful blog. Stellar combination! I think these are going to make an appearance in my kitchen really soon! Just found your blog the other day (from your comment in my blog...thanks :)....love it...so many great recipes! Mary, looked for your email and can't find it. I used your recipe and linked back to you on my blog. If this isn't ok please email me brusedsatin@gmail.com and I will remove it immediately. Amazing recipe. Your blog is beautiful and these cookies look AMAZING. Wow. I am not much of a baker but these make me want to try! Anything involving Nutella must be worth it. I'm not sure which my husband likes more: peanut butter or Nutella. Needless to say, he would go gaga for these! WOW. These are crazy good! Thank you so much for the recipe I LOVE THEM!!! Thank you sooooooo much for this recipe! I just made these with my son and they are to die for! If you're in need of the metric measurements, I converted and tested this recipe. Enjoy - these scored major points with my wife! Packet of brown sugar? Like a tiny one? Looking forward to making these this weekend for a cookie exchange. About how many dozen cookies does this make? I can't wait to try them! Thanks! Do you know how many cookies this makes? @Anonymous: It depends on the size but roughly a couple dozen. Enjoy! @Anonymous: Yes, they are! As always, if you prefer softer cookies (I do, too), minus a few minutes off of the cook time! Enjoy! I just made these and they are amazing! definitely making them again! Mine did too. Maybe too much flour? They wern't as gooey and soft as I thought they would be. More crumbly and dense. Thanks for posting this, I'm going to be sharing it on my blog in a Round-Up of Nutella Recipes, I hope you don't mind. You can check it out here if you like. Peanut butter cookie doughs do tend to be rather crumbly. Don't try to roll the dough out and spread nutella on top like a pinwheel cookie.. too crumbly for that! Those look SO yummy! I featured them today on my “Top 10 Nutella Recipes” post. Feel free to grab a “featured” button. Also I would love for you to share this (and any other creations) at my new linky party “Pin It and Win It Wednesday” @www.cheapcraftymama.com! nutella is not good for you!!! it has 2.5 g of saturated fat per serving! eakkk! marketing works..but not always in a good way. Oh my, I just made these and they are amazing! Like melt in your mouth good. Dangerous though...I just ate 4 in one sitting! My cookies were very crunchy despite my attempts at shorter bake times. Any ideas? Thanks for the recipe...they were very tasty.